You may not be at the best place in your life yet, your reality if you connect with it deeply may keep you never from never reaching where you want to be. Don’t let this be the case for you, look for the possibilities always. Are you always grateful for everything that has shown up in your life, good or bad so far? I know this was a difficult one for me when I first realized there is more to life than just feeling like I am stuck on a treadmill of never ending challenges with sucky outcomes. Yeah my life has not always been awesome, I have had many setbacks and tragedies just as we all experience in life but years ago I didn’t handle myself the same as I do now. I look for things to be grateful about in every situation, remember every apparent setback comes with a seed of equal or greater opportunity. The more aware you are of what you are focusing on each day will be a major indicator of what you are bringing yourself in alignment with. I know it may be difficult to disconnect yourself from what you current situation looks like. The thing is you have to if you ever want it to be different. You are more powerful than you ever imagined, your thoughts are bringing to you the opportunities to make them your reality. Awareness is key, examine your thoughts and you will know if the opportunity feels right. If it does, take action now. Action will also erase doubt and anxiety and build confidence; even if you happen to fail you will be a better person because of it if you learn the lesson and see the new opportunity. Get back into that childlike spirit and have fun with creating your new reality, it will make it happen much faster when you stay in that happy and grateful state. See what I’m doing to get healthy and happy right here. 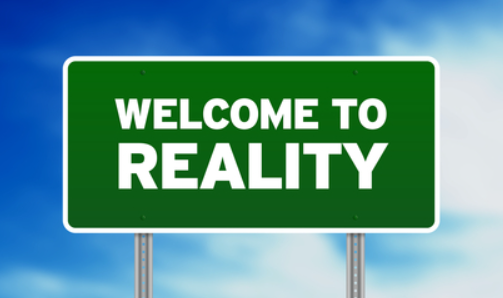 Thanks for stopping by and checking out my post on Don’t Be Blinded By Your Reality.